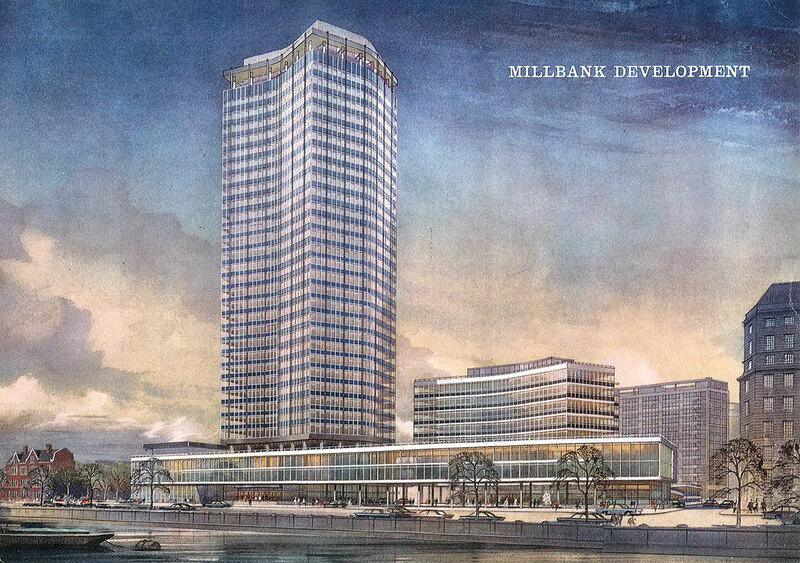 At its construction in 1963 Millbank Tower was one of the first high rise buildings constructed along the Thames and was London’s highest structure until surpassed by the G.P.O Tower two years later. The concave and convex shape of the 32 storey tower rising above a two storey podium and the complimentary Y shaped eight storey block was an innovative and sophisticated design. It features high quality curtain walling and Britain’s first use of projecting stainless steel mullions. All these features have contributed to its Grade 2 listing and it is now regarded as one of London’s most significant post war buildings. Originally known as Vickers Tower. Designed by Ronald Ward and Partners. One of the first tall buildings to be built along the River Thames.